October 10, 2009 was a lovely day in West County. More than three dozen people spent part of the day looking at the eighteen homesteads on the tour. 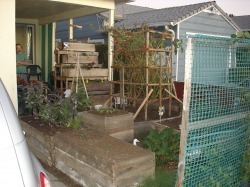 The eighteen homesteads were in seven different zip codes in five cities: Richmond, El Sobrante, El Cerrito, San Pablo, and Martinez. Forty-three people from thirteen different zip codes visited the homesteads. Most of those people were from Richmond: twenty-seven people came from zip codes 94801, -04, and -05. The average participant visited five homesteads during the 3-hour period. The average homestead had twelve visitors. Of the forty-three visitors, only four listed themselves as not having gardens. Twelve said they "sort of" have gardens. 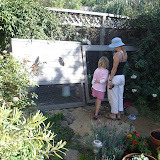 Click on the picture of Alexis's chicken coop below to see the album of gardens on the 2009 Tour.